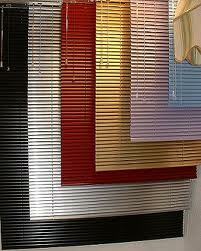 Venetian Blinds come in a variety of finishes. Including Wood, Plastic and Aluminium. Large blinds can be rather heavy so if possible keep them small. Divide window into two or three smaller blinds rather than one large, and sliding doors into two blinds rather than one large blind. For Bathrooms and kitchens go for plastic slats, as the aluminium slats could corrode from the humidity in the bathroom or kitchen.